The first ever European incarnation of a WPTDeepStacks event took came to a conclusion on Sunday night after Sulaiman Sesay bested all before him to take home €24,050. In total a healthy 336 players lined up and sat down for the inaugural WPTDeepStacks Main Event in Malta. Costing €400+€40 and taking place inside the plush surroundings of the Dragonara Casino, WPTDS-Malta proved to be a success from start to finish with players from across Europe, as well as international pros such as Michal Mizrachi, all doing their bit to put on some high quality poker action. However, as the days wore on and the blinds slowly crept up, only one player could emerge victorious and that was Sesay. The French grinder may have started the final session as the tenth ranked player out of 13 remaining, but that didn't stop him from putting in the performance of a lifetime as the pressure mounted. Indeed, while those around him lost their heads and fell by the wayside, Sesay became a veritable Hoover by sucking up the chips left by the carnage taking place around him. By the time just six players were left vying for the title, Sesay had taken the chip lead ahead of Yanev Chavdar. However, as Chavdar would prove, having a healthy stack wasn't a guarantee of staying alive in the competition. As the finale got underway, Chavdar was the first to fall after his pocket queens were outrun by Fabio Berti's pocket eights. That elimination threatened to turn the action on its head; however, as the like of Ina Pavlova, Mario Sciberras and the aforementioned Berti fell, it was Sesay who remained strong. With a 2 million chip lead over Giuseppe Polichetti, Sesay agreed to an ICM chop of the remaining prizepool. That split left the players vying for a seat in the WPTDS Championship in Calgary which is set to take place in December. A brisk start from Polichetti gave him an early surge of chips, but by the time Sesay had composed himself he was back in control and after making a move with Ac 9s he was able to clinch the title. 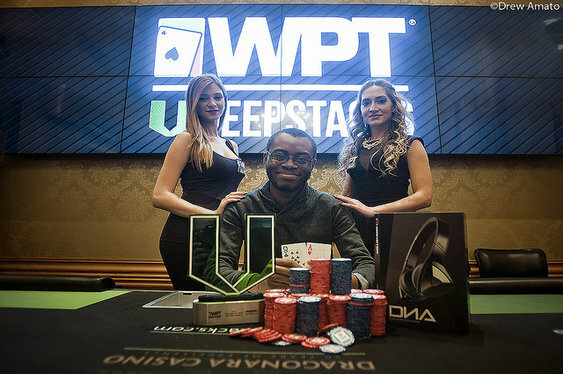 With his opponent's 8c 9c unable to cause an upset, Sesay was able to sit and smile as the final pot and the first ever European WPTDeepStacks trophy was pushed his way.